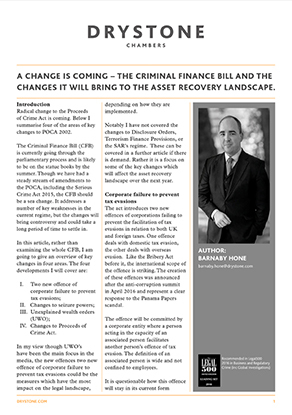 Further to his previous article on piercing the ‘Corporate Veil’, Barnaby continues this series of articles on issues relating to the Proceeds of Crime Act (including Asset Recovery) with the following piece on the Criminal Finance Bill (CFB). The next update to this series will follow in February 2017. Barnaby specialises in all forms of Asset Recovery, with particular expertise in International Asset Recovery. He is a contributor to the chapters on International Asset Recovery and Terrorism Finance in the fifth edition of Millington and Sutherland Williams on the Proceeds of Crime, due to be published later this year.